Just like Vonnegut’s Billy Pilgrim, I’m in one place and suddenly back in another place—in the flash of an instant. I noticed this nearly four years ago while sitting in a management meeting on the 8th floor of a downtown Minneapolis office building. The meeting room had floor-to-ceiling windows that showed the office cubicles, beyond which were windows facing downtown buildings. Just another day, no big whoop. But as I looked out that window, I’m standing on my bedroom headboard looking out that window at our garage and Casco Point Road beyond, sometime in 1972–1975. A UPS van goes down the street, past the tall elms and oaks and the Drake family’s tennis court. Just another day, no big whoop. So, an office window in 2007 is what I saw in, say, 1973. Conversely, my bedroom window looked out over downtown Minneapolis. Two places. Same time. I knew this, instinctively. I bring this up because it’s happened many times. I can’t plan it, can’t prepare for it, can’t will it. It just happens. The 1976 diary records a family trip we took the first weekend in October. Dad rented a Winnebago and Friday afternoon, October 1, the Family Project pulled out of the driveway at 2821 Casco Point Road at 6:00 central time. Later we stayed at a Wisconsin campground for the night. 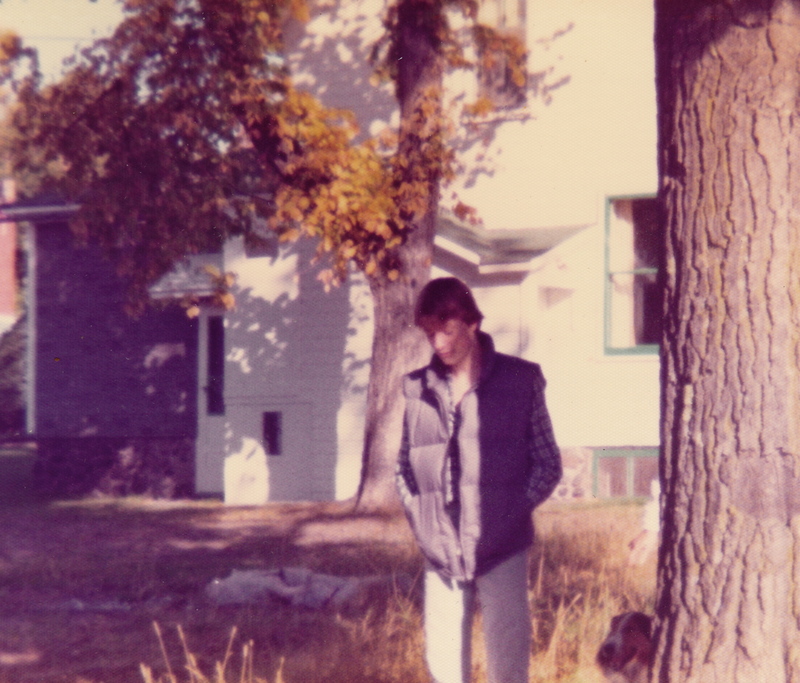 So, here’s the unstuck thing about that weekend—it was similar to camping trips our family took in the late 1960s, when Dad rented camper-tents and bought kerosene lamps and a Coleman camp stove and ceramic coffee pot and new fishing gear. We all had to come along. As I read about the Bayfield trip, I had an “unstuck moment” and it was this: beach camping. It could’ve been in North Carolina, or Virginia, or even Maine. There were other families at the campgrounds, campfires at night, transistor radios blaring, kids playing in the sand. Cute shy girls meeting scruffy shy boys. It’s a magical kingdom of memory that I’d completely forgotten about. Dad took us to that magic place, where we met those friendly beach angels. Time is a lie. “Now” is a necessarily impossible idea. Wrap your arms around the present and it has evaporated. The platitude of “all we have is now,” is as inscrutable as Rene Magritte’s “This is not a pipe.” The past may recede, the future may impose, but the present is ridiculous. Then I found this picture (left). 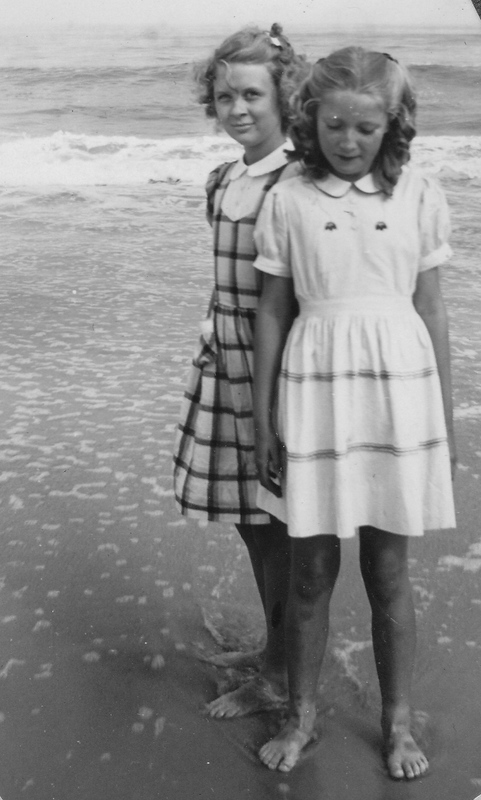 It’s of Mom at the beach with her beloved cousin Lois, who was in every sense the only sister Mom ever had. It was probably taken at Cape May, New Jersey, at her Uncle Herman’s place, in the 1940s. Mom is looking down, but Lois stares right at the camera. I can feel the tide rushing past their feet, the sand ebbing away. I can feel it. I am there. It is happening now. ~ by completelyinthedark on November 26, 2011.